It is my hope that through these pages, you'll find some of your friends that you have served with and be reunited. I can't say how much the Vietnam experience has changed my life but as I get older I realize how precious are the people with whom I had the privilege to serve. God bless every individual who heard the call to duty and served in Vietnam and especially to the ones who did not return. 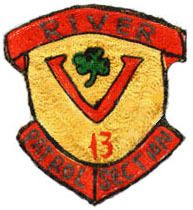 If you know of anyone who was a member of River Division 513 or were a member yourself, please send me your name, rate and rank, address, phone number and email address as well as the years that you served in Vietnam with 513. I will then be able to add your information to the Roster page of this web site. Also, if your email address has changed please notify me so I can keep the Roster page current. I know some of the email addresses that I have listed are not correct. Please send this information to steve@rtmc.net and I'll do my best to keep the Roster page current. Hopefully this information will help others to locate you as well as helping you to locate your old buddies. If you do not wish to have your address and other information published I completely understand and will respect your wishes. Thanks for your help. I have added some names on the Roster page from a December 1967 Roster and a later Roster and I need your help in locating addresses and phone numbers for these people. If you know where these people are or any information about them, please email me (steve@rtmc.net) or Mike Antonio (mantonio1@msn.com) so we can complete their information. We owe thanks to Mike for this information. It was in a newsletter that was sent to his parents dated Nov. 1, 1968 from the Commander of River Division 513 Lt. H.J. Feeney III. This newsletter is now on Mike's page along with a map of the area that 513 was patrolling at that time. I would also like to thank the following guys who have helped me financially to pay for this site. I had to expand the site recently as up to this point it was a free site, but as I kept adding more photos and pages I had to start paying to expand the site. Thanks to all of you for helping out! Sign My Guestbook View My Guestbook 03/19/13.